No single entity designed the U.S. healthcare system; it evolved over time in response to market forces, government programs and competing interests of large industry stakeholders. The result? A complicated and wasteful system, long overdue for significant reform. In an effort to change the playing field, the government has wieldedthe blunt instrument of funding and reimbursement. The Affordable Care Act, Meaningful Use, and other federal programs have successfully disrupted the status quo, particularly for healthcare providers and payers. MACRA aims to continue this disruption in the future. Many industries respond to a shift in the playing field with increased mergers and acquisitions. Combining the resources of two organizations – whether they are competitors or complementary – allows the new organization to have access to more resources, take advantage of economies of scale, and reach more customers. Predictably enough, healthcare has experienced a high level of M&A across the board for the last few years. In fact, mergers are up 6% compared to last year. In recent months, we have seen mergers blocked and permitted. Two deals currently taking center stage are the mega-mergers in the insurance industry: Aetna/Humana and Anthem/Cigna. Last month, seven senators wrote a letter to the Department of Justice urging them to block these deals. (It’s interesting to read this letter for an overview of how the insurance industry, particularly the Blues, operate.) Four weeks later, the Department of Justice announced it would file lawsuits to block these mergers, stating that they would result in reduced competition. One of the consensus predictions for 2016 was that some mergers may be blocked, and we are seeing that happen with deals involving large companies in a given region. The goal of healthcare reform is to turn competitors into collaborators by encouraging continuity of patient care, even across provider and payer boundaries. For example, the Office of the National Coordinator is emphatically calling out data hoarders. The message from the Department of Health and Human Services is to put patient care first and competition second, but the Department of Justice is signaling that competition remains important to prevent catastrophic price increases . Providers and payers are wondering exactly where to draw the line. Granted, there are plenty of ways to cooperate across organizations. Merging with or acquiring competitors is only one way to accomplish that. It’s the most straightforward approach, but as we are seeing, the federal government isn’t going to allow it in cases where the market impact could be detrimental for the greater good. Changing the payment structure from fee-for-service to value-based reimbursement is going to be long and difficult. And – at least the way it’s written now – one of MACRA’s side effects will be to put pressure on small organizations, forcing them to merge with larger competitors or go out of business. In the end, the winners will be the organizations and partnerships that figure out ways to capitalize on new models of reimbursement without resorting to monolithic hegemonies. Last week the White House announced $55 million in awards to four medical centers across the country to advance the President Obama’s Precision Medicine Initiative (PMI). The end goal is to build a database of 1 million people including their genomic data that will serve as the basis for researching targeted therapies. Last week’s cash infusion kick starts that program. One of the 2016 predictions talked about precision medicine emerging as the new cutting edge for healthcare providers. An announcement of funding is a great first step, but it’s too early to say if this prediction rings true. Providers are practicing precision medicine today in isolated pockets and outside the scope of the PMI, but these are rare cases. The majority of healthcare follows traditional best practices, which involve treating all patients as average rather than unique. Does this prediction have a chance of being realized by the end of 2016? Doubtful. The current level of funding will accelerate the already fast-moving field of precision medicine, getting it out of the lab and into the clinic, but the journey from seed funding to actual practice generally takes more than six months. Population health is a six-step cycle that involves segmenting a patent population, providing targeted care, and measuring the outcome. Each of the six steps can be the focus of improvement, but doctors need to do a good job on each step in order to make a population health strategy effective. Precision medicine is mostly about the “manage care” step of the cycle. A precision medicine approach to managing a patient’s care involves taking their circumstances, other health issues, demographics, and even genetic information into account when prescribing a treatment. By selecting the best treatment for each patient, it’s possible to improve health outcomes, measured in the next step in the population health cycle. Precision medicine is not at odds with population health or a replacement for population health; it is complementary and synergistic and provides a way to improve one of the six facets of the population health cycle. Measuring outcomes is the part of the cycle that is most mature. Any doctor participating in a quality program or risk-sharing agreement with Medicare, Medicaid or a private payer is required to submit quality measures for their patients. Often, these measurements impact reimbursement. 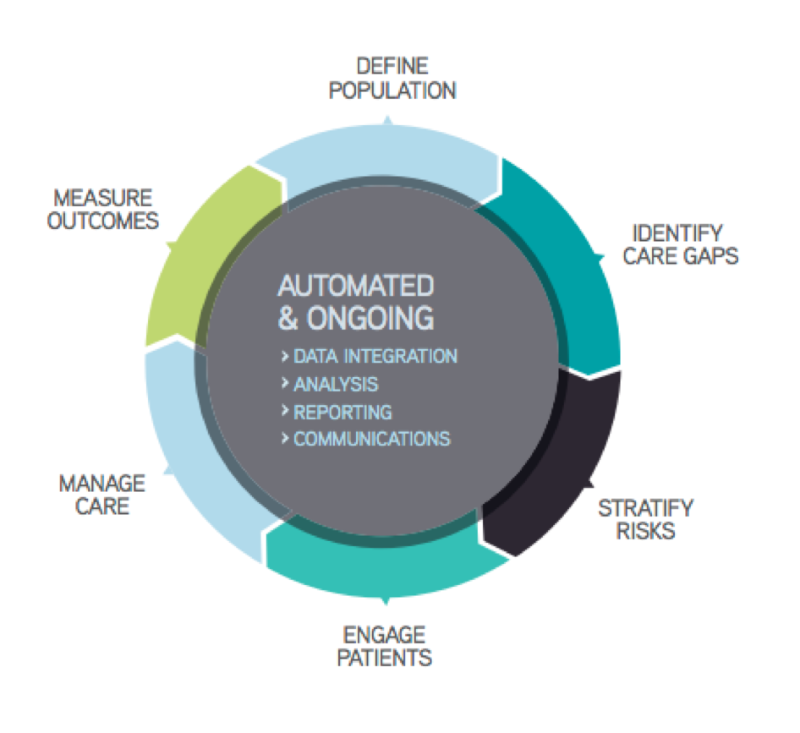 In conjunction with measuring outcomes, payers have also done a good job of defining populations, identifying care gaps and stratifying risks. There’s still room for improvement on these and the other steps of the cycle, especially around patient engagement. Version 1.0 of population health management is here and gradual refinement will occur over time. Today’s post is a digression from the usual Healthcare IT subjects. Instead, I want to focus on the presentation skills of HBO’s John Oliver because Kathy Klotz-Guest recently posted about some of the specific attributes of Oliver’s content that makes audiences want to watch and, more importantly, share it. My focus is a little different. I’ve done an analysis of the structure of a John Oliver piece and want to show how you can use his techniques to improve your own presentations. I based my analysis on a story from Last Week Tonight about Dr. Oz that’s available on YouTube. Warning: language is not safe for work. I began my analysis by downloading the video’s automatically generated subtitles usingDownsub, which gave me a time-coded transcript. I did some cleanup with a text editor to get the data into rows and columns, and then I imported the data into Excel. Next, I watched the video repeatedly. Every time the audience laughed or applauded, I (subjectively) rated the response from 1 (chortle) to 5 (roaring applause). I included these ratings in a new column in the row that contained the text to which the audience reacted. 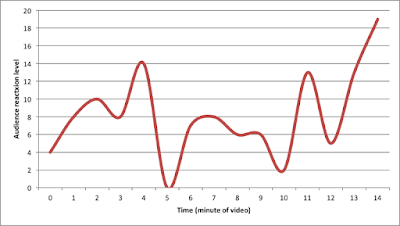 After rating each reaction and dividing the video into one-minute buckets, I was able to plot the audience’s overall reaction at each minute of the segment. We can see that the story about Dr. Oz is not uniformly funny. In fact, there are two points – during minute 5 and minute 10 – that aren’t very funny at all! The end of the segment goes off the rails, with John Oliver bringing in one gimmick after another to prove that it’s possible to engage viewers without making misleading health claims, and the audience goes crazy for nearly two minutes. What can we learn from the shape of the reaction level curve? It’s important to mix arguments with amusements. Follow the 60/40 rule. Every line in John Oliver’s story is either part of a joke (37%) or part of a logical exposition designed to make a rhetorical point (56%). Some are both (7%). If the 7% of dual-qualifying lines are evenly split between arguments and amusement, the argument-to-amusement ratio is almost exactly 60/40. In John Oliver’s case, he delivers the amusements as professionally written comedy. The entertaining parts of your presentation may be anecdotes, statistics, charts and graphs, images or audience surveys. Develop “argument wells” within the structure of your presentation. 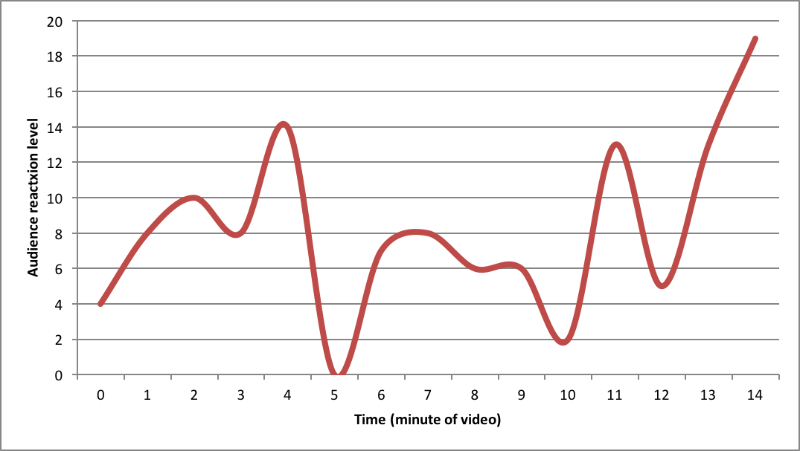 During minute 5 and minute 10, the graph dips into a “well” characterized by virtually no reaction from the audience. In these argument wells, John Oliver is making serious rhetorical arguments about the danger of blurring the lines between health advice and entertainment. There’s no laughter or applause during these times because the audience is busy making sense of the logic. Argument wells provide an opportunity to focus on a really important part of the exposition without distraction from anything amusing. These are useful for driving home your presentation’s main points. Notice that the two argument wells are spaced five minutes apart. 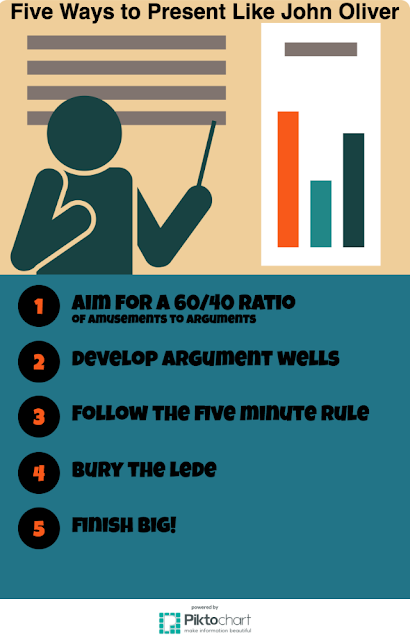 Once every five minutes is a good pace for bringing serious arguments to the forefront of a presentation. That means that in a 15-16 minute segment, it’s possible to have two or three spots where the argument goes in depth. The space between wells will still contain important points, but they’ll be embedded within more entertaining aspects of your presentation. Bury the lede. (And yes it’s “lede” not “lead”), as Bradford taught me). The thesis of this piece is “dietary supplements in the US are shockingly unregulated,” which is not explicitly stated until the first argument well. Leading up to this point, John Oliver lays out quite a bit of evidence that points in this direction to maintain interest by building suspense. Most presenters will not be able to match the finale of John Oliver’s segment about Dr. Oz, which features puppies, a marching band, and a tap dancing Steve Buscemi, so you’ll have to set your sights more modestly. It’s too late to make any new points in the final moments of your presentation, but it’s a great time to review or summarize your content in a maximally entertaining way.